Large parrots can live for 40 years or more. When you bring a parrot into your household, you're truly making a friend for life. Depending on the species you choose, your new bird may have a lifespan almost as long as yours, so you can look forward to decades of talkative, clever companionship. Parrots aren't one single species of bird. Instead, the group called parrots includes 279 different species, ranging in size from tiny birds you can hold in your hand to large birds the size of a house cat. In general, the larger the parrot, the longer the lifespan, especially in captivity where the birds are able to reach their full aging potential. African grey parrots, which are renowned for their speaking ability, have a lifespan of about 40 years, and some African greys live beyond the age of 60. Amazon parrots, which include yellow-headed and blue-fronted Amazons, have an average lifespan between 25 and 50 years. Macaws also have an average lifespan of 25 to 50 years. Parakeets, which are also known as budgerigars or budgies, are popular with children and have an average lifespan of 5 to 15 years. For parrot species that have only recently gained popularity as pets, such as the Pacific parrotlet, the average lifespan remains unknown. This medium-sized parrot, which is around 5 inches long, most likely has a lifespan of 15 to 20 years. Parrots in captivity live longer than their wild relatives because they are less likely to be exposed to predators and disease. Your parrot will thrive best if provided with a secure cage with ample space for him to climb and spread his wings. Keeping the cage area clean and providing your parrot with an appropriate diet can help him stay healthy and resist diseases that might shorten his lifespan. Genetics can also play a role in longevity, so choose a bird from a reputable breeder who can provide health information about the bird's parents and personal health history. Because of their long lifespan, parrots are generally not recommended as pets for small children or people with uncertain living circumstances. If you adopt a young parrot with a potential life expectancy that reaches into your own 70s or 80s, make contingency plans for the future care of your bird in case that becomes necessary. 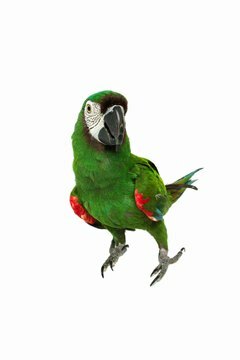 Many parrot owners opt to put a provision in their wills for the care of their birds. If you aren't sure about whether you'll be able to care for a parrot 40 to 50 years down the road, adopting an older parrot whose owner has passed away can be a good way to experience life with a parrot without committing to a full lifetime of care.